When a biotech stock shoots up 37.5% on a day when most biotech stocks are dropping it’s certainly worth taking a look at. So what happened with Arrowhead Pharmaceuticals Inc. (NASDAQ:ARWR) stock? 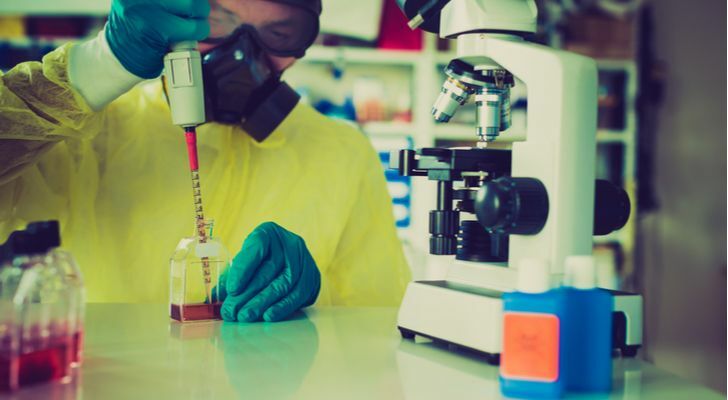 ARWR announced that it will present new clinical data at a World Gastroenterologists Summit, and the markets responded positively to encouraging clinical results from a Phase ½ trial for a drug treating hepatitis B virus infection. Arrowhead also demonstrated positive safety data. The only adverse events patients reported were mild and self-limiting injection site adverse events — occurring about 10% of the time. Upper respiratory tract infection and headache were the other most commonly reported events. At this weekend’s conference, scientists and doctors will get more details on the safety profile, dosage, and mechanism of action for the proprietary Targeted RNAi Molecules platform (the drug’s trademark name is TRIM). The high activity of ARO-HBV is encouraging at this early phase of the study. With dosing levels of 35, 100, 200, 300, and 400mg now complete, the company may continue to the next phase. The 1+ to 3 log reduction in surface antigen is a giant leap forward in developing a drug that treats HBV patients. Setting a price target on an early-stage biotech is mostly a guess. The company has no cash flow, so it is not possible to assign an accurate fair value on ARWR stock. Still, Arrowhead’s future performance is encouraging. Per Simply Wall St., Arrowhead is expected to grow its annual earnings by 39.5%. This is a rate that is well above the U.S. market average of 16% and the biotech annual growth rate average of 23.6%. If it brings the product to market, revenue could potentially grow 53% annually, compared to the biotech average of 18.5%. On the stock market, Arrowhead stock’s rally is even more impressive because the iShares Nasdaq Biotechnology ETF (NASDAQ:IBB) fell 1.78% on Sep 6. And Gilead Sciences (NASDAQ:GILD) fell 2.21% on Thursday. Gilead, which trades at a P/E of just 12.5 times, makes Tenofovir Alafenamide, a drug that treats chronic hepatitis B virus. Of the six analysts publishing a 12-month price target for ARWR stock in the last three months, the average price target is $21.42, implying upside of 10.5% (source: Tipranks). Finbox.io is another tool I use often to number crunch a stock’s fair value. Of the three models posted, the average fair value is actually 20% below ARWR’s $19.39 closing price yesterday. The low target price is due to the lack of EBITDA or revenue. Until the company brings its core drug product to market, investors may only speculate on the stock’s worth. Arrowhead’s strong performance on a day of declines for biotech cannot be overstated. Teva Pharmaceuticals (NYSE:TEVA) — who counts Berkshire Hathaway as one of its investors — fell 3.93% yesterday. Fast-growing Regeneron Pharmaceuticals, Inc. (NASDAQ:REGN) fell as buying volume slowed. Conversely, Arrowhead stock’s big rally happened after ARWR climbed steadily throughout the last nine months, trading at around $4.00 in Dec. 2017. With over 30 million shares traded, Arrowhead is now taking center stage. Article printed from InvestorPlace Media, https://investorplace.com/2018/09/arrowhead-pharmaceuticals-not-done-rallying/.